This is the last A to Z Challenge blog post for this week! I’ll be back on Monday with more. Hope everyone has a great weekend! Walk past a group of jasmine vines and run your hand along the edge. Release its perfume into the air. 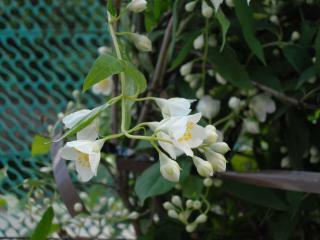 Is it any wonder that jasmine is used medicinally as a relaxant, or as an aphrodisiac? According to legend, the Duke of Tuscany brought Jasmine to Europe in 1699. He wanted to keep the plant for himself and didn’t allow cuttings to be given away. His gardener, however, had a beautiful sweetheart with a birthday coming up. He was a poor man, so he had nothing to give her. He picked a sprig of jasmine for her to wear. Here’s the cool part: she didn’t just wear it, she planted it, and it rooted. Over time the plant grew, and she grew others from its cuttings and sold them to the wealthy. Then this enterprising woman and her gardener lover could afford to marry. And this, my friends, is one reason jasmine shows up in bridal bouquets even today (though I suspect it’s more because it’s pretty and smells good). It’s sadly believable that someone would want to covet a beautiful item and keep it for himself rather than sharing it with the world. I’d say it’s the Duke’s loss, because he does not know the joy of giving beauty away freely. My favorite days in the garden are when I harvest enough to share. Sometimes it’s in a baked item, such as a fruit cobbler…I can taste the mix of sweet and tart of my plums even now. A friend’s children love my applesauce, made with home-grown apples and not a lick of extra sugar, just a touch of cinnamon. Potatoes, garlic, figs, tomatillos — all find their way out of my yard and into the kitchens of others. I tip my hat to the beautiful sweetheart of the story, who didn’t just wear the jasmine, but planted it. Rather than going for the instant glory of scented flowers in her hair, she saw the value of waiting. By delaying gratification, her dreams came true, and she and her beloved husband prospered. Nadine, this is a delightful story and so wise. Sharing the things we love and beauty is important in this world. The gardener’s girlfriend, soon to be wife, was wise. Thanks for spreading your beauty in the world. Thanks! I really loved this story, too, and am thrilled to share it. I would add that I am enjoying all the generous sharing from you and our other fellow A to Z bloggers. Life is much more fun this way. I’d love to smell fresh jasmine. I don’t think it grows in Minnesota. Also, it makes great tea! Yes, jasmine tea! I didn’t mention that. Thanks for the reminder! My hubby does a lot of jelly and jam making, mostly just to give away. And Bread & Butter pickles. We also give away all of our extra yard eggs. Like you say….for the joy of it! Awesome! We get our eggs from our lawyer…I just love telling people that! It seems like part of the community spirit here. I am surrounded by generous people, and they inspire me. Enjoy the weekend. A to Z is a challenge and if you can take a break then do so! I’m having such a blast reading these blogs! I don’t think I realized how much fun it would be. I’ve done blog hops before, but this one is special, I think. I had no idea! One of the things I love about the A to Z Challenge is the stuff I learn. Beautiful story! I didn’t either until I started researching for the blog post. I’m learning a lot, too, both from getting background for my posts and reading the posts of others. Thanks for visiting! Lovely post. I really love the background story of how the plant propagated, too. Great story! I’m only sorry it took me so long to find your blog, because I love plants and the stories associated with them. I’ll definitely be back! Thanks so much for finding me! It takes a while with A to Z to catch up with everyone. I love the name Jasmine… it’s my niece’s name. Today I’m just jabbering in a jolly jumble of words that mean jack! But I’m still jovial and jubilant! Hi, Michelle! *waves* Happy J-Day to you (a day late). I love this story of jasmine! I agree-it’s so much more fun to share the bounty. My dad always planted more than we needed each year in the vegetable garden in case someone else in the community didn’t have any. I love hearing this story about your dad. My hope for the future is that the garden is prolific enough for me to take a wagon full each week to the food bank. We give financial support to their three food gardens, but I love the idea of taking food I grew myself. The director of the food bank said that produce from the stores is at the end of its shelf life, but the food people bring is as fresh and good as anything we eat…and I like the idea of that. Greetings from the USA and thanks for visiting my blog! People always find a way to bring nature into a city, even if it’s a small pot. I’m visiting New York City right now, and I love to see the pots and tiny bits of green everywhere. I wish I had enough hair for a floral garland! That would be nice.